The story speaks of the rise and fall of the world's most notorious sandalwood and ivory smuggler, Veerappan. Koose Muniswamy Veerappan (Sandeep) born to the jungles in South India, took to killing while still in his teens. Till he was ambushed on October 18, 2004, he had killed approximately 97 policemen and 900 elephants. Since everything about Veerappan made headlines in his lifetime, the story has no surprises. Also the docu-feature style narrative doesn't have too many edge-of-the seat thrills. But if you are keen and curious, to see the life and times of one of the most dreaded criminals, who twirled his moustache and brandished his gun with equal finesse, Varma provides you that vicarious pleasure. The main half, has its minutes. Watching Veerappan stride over the screen, murdering men and creatures thoughtlessly gets you to hold your breath. Obviously, the blood, gut-spilling and his unrefined strategies for crushing his casualty's appearances with a stone make your skin slither. Cautioning: in the event that you are timid, you may just open your eyes to absorb the rich greens and the smooth waterfalls of Karnataka that have been caught stunningly. On the other hand, you may end up grinning, when you get the sentimental chitchat between the dacoit and his dharam-patni, Muthulakshmi (Usha Jadhav). The second half required chomp. It ought to have been all the more grasping. 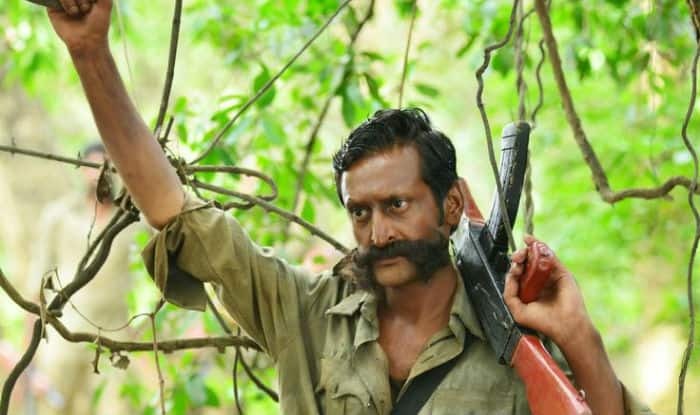 The arrangement made by the Special Task Force (STF) to wipe off Veerappan required dramatization. Here, it is left to one officer (Sachiin) to let you know about 'Operation Cocoon' that was made to bait the dacoit out of his sanctuary. Additionally the screen-procedures became all-good too conveneintly. Wish the executive, who gave us remarkable mafia material like Satya, Company and Sarkar, had pressed in some additional punches. In all decency, Sandeep brings Veerappan alive and the National Award champ Usha as Muthulakshmi is persuading. In spite of the fact that not in top structure, RGV redeems himself to some degree. Also, his film allows you to get up, close and individual with the infamous criminal who made a monkey of the Tamil Nadu and Karnataka Governments, since he knew the provisos in the framework. 1. The film is based on the events leading to Operation Cocoon to capture or kill Indian bandit, Veerappan. 2. The film was also made in Kannada and was dubbed in Telugu and Tamil. 3. The release of the film was stalled by the Bengaluru civil court after Muthulakshmi, wife of Veerappan, filed a complaint against Ram Gopal Varma for breaking the bond. Muthulakshmi stated that the bond was only made for making it in Hindi and dubbing it in other languages, while the director had taken the movie in four languages. Submit your reviews on this movie in the comment section below.